Our regular Everton in the 80s feature continues with a look back at the 1985-86 season. The Blues had endured a difficult start to their defence of the First Division Championship, but had out a fantastic string of results together to propel the team back into title contention. Gary Lineker was enjoying a tremendous season and over the final fortnight of January he had added a further four goals to his impress haul of goals. Two away at St Andrews ensured Everton beat Birmingham City to go second in the league and he followed that with another brace at Goodison to lift Everton to a 3-1 win in the FA Cup at Blackburn. Pat Van den Hauwe was also on target, but the Observer newspaper published the following day was lavish in its praise of Lineker. In the end, as so often in this Goodison season, it was Lineker’s deadly finishing that proved decisive. He is a remarkable player, able to cloak himself in anonymity for perhaps 75 minutes, then scoring twice and threatening three more goals in the remaining minutes. With progress to the FA Cup fifth round secured, Everton were next to entertain Tottenham Hotspur in the league, who incidentally were also to be their opponents in the next round of the cup. The story is taken up by the Guardian. 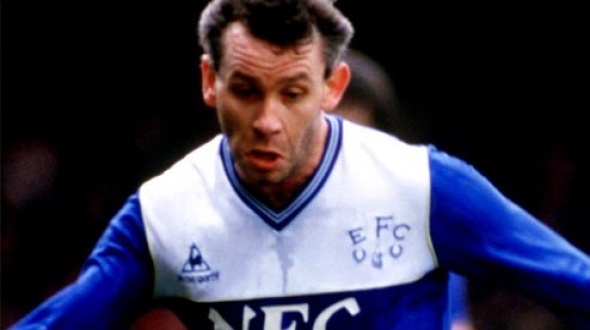 The talk of course, was of Peter Reid, returning after five months of kicking his Achilles heel to score a three point goal to take the champions to the top of the First Division. Hours after the final whistle thoughts were less of the England midfield player’s expertly taken goal but more of the nature of the victory. A wild wind and an obdurate Tottenham defence had scrubbed the finesse from Everton’s play by the second half and as the digital clock flicked ominously towards zero there seemed little prospect of a home goal. News on the transistors that Liverpool were losing and Chelsea drawing added to Goodison’s frustrations, until Reid’s goal uncorked the emotions. A quick throw by the impressive Pointon, a wriggle and cross by Lineker and the ball was knocked down to Reid who, with seemingly all the time in the world, let it drop and scored via the underside of the bar. It was as if he had never been gone, but oh how weary were those little legs. Reid had scampered around in the first half with demonic intent, but inevitably the pace slowed him.